Holy Nativity School — Yoga Ed. This is no easy task. Preparing students for success in the 21st century requires more than your standard reading, writing, and arithmetic. As the Head of School, this is something that Tim Spurrier knows well. It’s his job to make sure that Holy Nativity not only keeps its doors open, but that the students, teachers, staff and parents in their community are being supported from the inside-out. Well-being, not simply academic success, is what drives Tim’s work. He wants his students to not only succeed, but to thrive. Supporting Tim’s understanding of his students’ well-being is the underlying tradition of the school. As Tim explains, “We are an Episcopal school, and we are called each day to be mindful.” Practicing mindfulness at Holy Nativity has come in the form of “mindful minutes” in both classrooms and the chapel, allowing students and staff the opportunity to “focus either through prayer or just sitting silently to relax their minds.” Moving from this tradition, Tim was looking for another way to give students and teachers a chance to decompress and build self-awareness, and as a former professional athlete, he knew that exercise could be a part of the solution. That’s where Yoga Ed. comes in. “I liked that the program provided our teachers with a resource to practice and teach yoga,” Tim says. “Plus, I really liked that it is research-based and has no religious overtones.” As a secular, school-based program, Yoga Ed. could fit naturally into the existing values and culture of Holy Nativity, while also making it easy for teachers to use it in class. And as a plus, many students and teachers were already familiar with Yoga Ed., as Yoga Ed. Trainer Harmony Turner had been teaching yoga as part of the school’s extended day classes with awesome results. As one staff member noted, Harmony was able to help the kids calm down after a busy school day, by centering them on their breathing and movement, and teachers began to see that yoga sessions could promote both productivity and happiness. From the success of the after-school program, Holy Nativity expanded their offering to a summer session and Faculty Yoga classes. Now for this school year, it’s time to take the programming one step further: into the classrooms themselves. As an Assistant Teacher and Director of Health and Wellness at Holy Nativity, Harmony has provided professional development workshops that enable the teachers at Holy Nativity to incorporate an extra dose of mindfulness into the school day, all through chair yoga. More mindful teachers and students are exactly what Tim had in mind, and the effect has been felt across all grades involved. 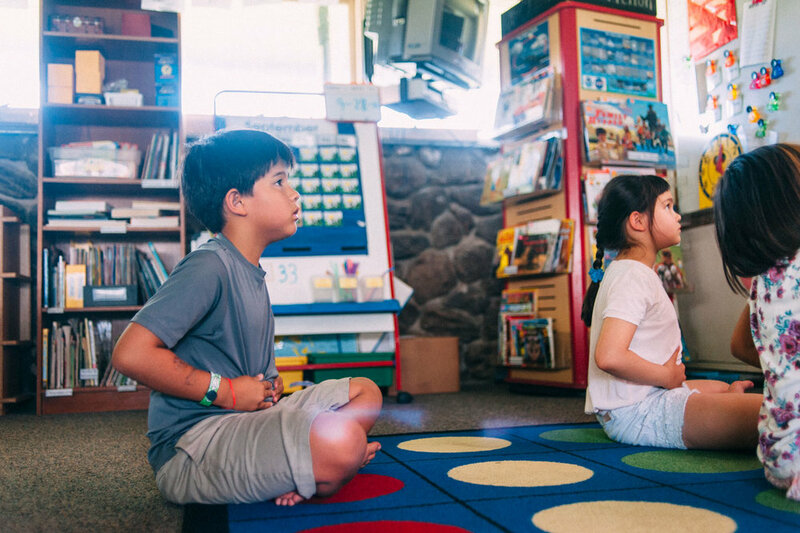 Even in first grade, teacher Jenna Visoria observes that her young students really “embrace the quiet time,” whenever she integrates yoga into their day. And for her, yoga is an incredible tool to help her meet developmental milestones. “First graders are constantly working on self-control with their minds and bodies,” Jenna explains. Through yoga, they’ve been able to build upon their bodily awareness and learn to better focus their minds, all while having fun and maximizing their limited class time. Up in the 5th grade, Staci Overton sees that self-awareness has benefitted her students in a different way. As her students undergo a variety of sometimes uncomfortable physical changes with the onset of adolescence, doing yoga every day has allowed them to become familiar with their bodies in an environment that is safe, nonjudgmental, and comfortable. And even better, the students love it. Now that the class is familiar with the regular routine, Staci lets her students take turns leading the sessions, giving everyone the chance to slow down, reconnect, and engage in a meaningful way. Aside from the obvious physical and mental benefits that have been experienced by students and teachers alike, Tim Spurrier anticipates an even bigger change in the culture of Holy Nativity. “I’m really big on common language,” Tim explains. “Often in schools, every classroom becomes it’s own universe. Teachers tend to teach to their strengths and are not always risk takers.” While this may not impede on student performance, Tim is all about taking school unity a step further. In other words, Yoga Ed. provides the opportunity for the entire community to participate in an activity together, “regardless if you have a 3 year old student or a 70 year old teacher.” The social support and cohesion that comes from this common language allows teachers and staff to better embody the mindful principles that they are imparting on students, and provides students with a consistent and empowering environment to indeed thrive. Learn how to get started with Yoga Ed. for your school today.